Youth workers till the soil in the Story Garden, one of Project Sweetie Pie's 25 gardens on the Northside. Photo by Uche Iroegbu. The Story Garden sits at the corners of north 35th and Humboldt avenues. A former “tornado lot,” it now boasts a bountiful garden brimming with tomatoes, raspberries, corn, peppers, snap peas, mint and dozens of other vegetables. Butterflies and bumblebees dance on the stems of each plant, welcomed by the planted milkweed, and a sign welcomes people to the garden and advises them of what is ready to be picked and eaten and what will require more time. When a neighbor comes to work in the garden, she dances on the sidewalk under the sun. The garden is intentional. Danielle Tietjen works to make sure that the food being grown represents the community around it, including her Hmong neighbors. “I don’t know what their greens are called, but I want to make sure we have it in our garden,” said Tietjen, who helps tend to the Story Garden. Before the garden was planted, Tietjen’s children played in the empty lot next to their home. Now they revel in its produce which, she says, just tastes better. In a year, Tietjen hopes to add a pumpkin patch to the garden so that children in North Minneapolis can pick their own pumpkins come Halloween rather than purchase them at Aldi or Cub Foods, the only two full-service grocery stores serving the Northside’s more than 60,000 residents. Tietjen has lived in North Minneapolis for 14 years “with absolutely no plans to move.” As the garden’s next-door neighbor, she tends to the garden daily, taking care to introduce neighborhood children to the readily-available snacks found there. “There’s a life force in the dirt, in the dead of winter when I’m putting the seeds in, I just feel like a part of me is coming awake again,” said Tietjen. Chaney believes that through food, and through renewed connection to the land, people come together, and when they come together and know each other, community grows. The Story Garden is one of 25 gardens operated by Project Sweetie Pie in North Minneapolis Fifteen of those gardens are taken care of by Project Sweetie Pie gardeners, the other 10 are through partnerships with the organization. 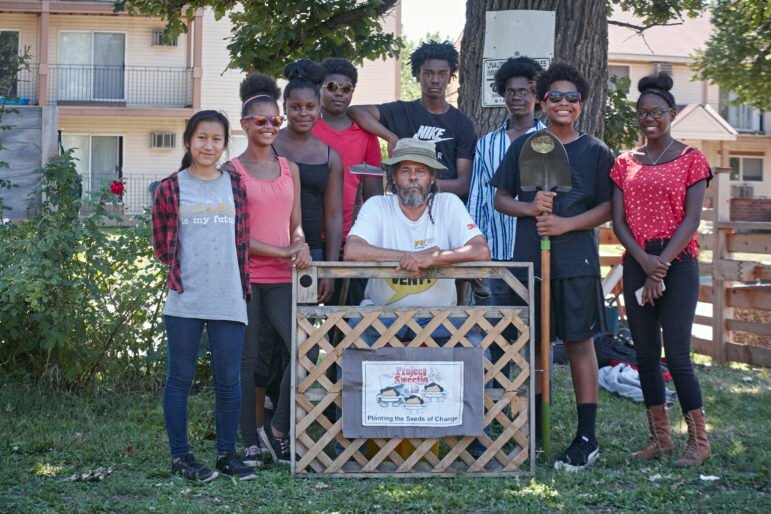 For Project Sweetie Pie organizers, and other food justice organizers in North Minneapolis, food is a tool being used to build a healthy community and transform the Northside economy. “The gardens lead to healed bodies out in the world. It’s a ripple effect on every level from the individual to the economy,” Tietjen said. 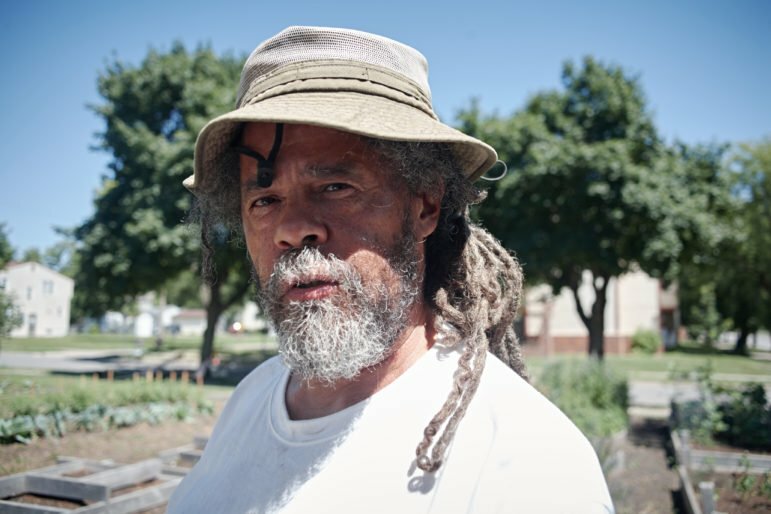 Tietjen and others are tending to the gardens as they work to regrow a new Northside economy. Michael Chaney. Photo by Uche Iroegbu. According to data from Minnesota Compass, North Minneapolis is more than 41 percent Black/African-American, with a total population of nearly 62,000. The unemployment rate for Northside residents is more than triple that of the rest of the city. North Minneapolis, according to the United States Department of Agriculture, is a food desert. In short, this means residents have limited access to grocery stores and fresh, healthy food. “The North Minneapolis food system is not separate from anybody else’s food system, so the entire food system has to change. The byproduct of that change is we would have a fair, just, and healthy food system for everyone. But until that happens, we’re just going to be trying to pull the elephant from whatever position we are in and saying ‘Hey we got the tail or I got the foot,’ but we can’t really get our arms around the fact that our food system is broken. And what happens is the people that are most victimized by something are generally people who are forced to try and change it,” said LaDonna Sanders Redmond, a food justice leader and HECUA’s Program Director of Agriculture and Justice. For organizers like Chaney, Appetite for Change staff and leaders, and others, food is a tool that can be used to transform the North Minneapolis economy and the Northside community. “All oppression is linked. Food is just a tool for organizing. It’s not really about the food. It’s about what the food brings: choice and dignity,” said Redmond. Project Sweetie Pie. Photo by Uche Iroegbu. Project Sweetie Pie’s gardens are just one part of a growing movement. Two grocery stores are set to open in the Northside soon: Wirth Coop will be opening in late 2016 and Pillsbury United Communities North Market—a health food store, community space, learning lab, and wellness center related to food-related illnesses—will be opening in 2017. Appetite for Change opened up its Breaking Bread Cafe in 2015 to rave reviews. And the West Broadway Farmers Market recently moved locations in order to support its expansion. 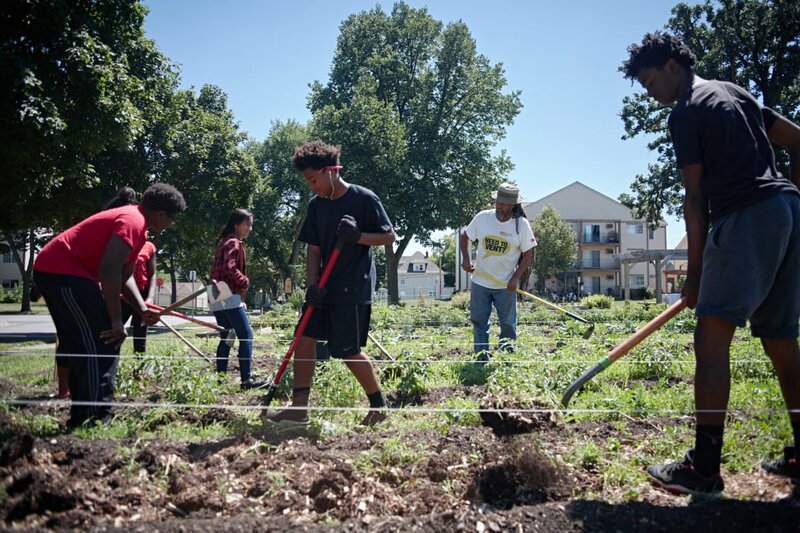 During the 2015-2016 legislative session, several different urban agriculture bills were proposed, including HF 3324/SF 3310 and HF 153/SF 534, both of which would have developed and funded urban agriculture pilot programs in communities like North Minneapolis. Neither bill passed. According to Chaney, state legislators instead chose to look “downstream” and support corner store owners and other vendors, what he calls “the landed gentry,” rather than growers and producers in places like the Northside, through their passage of the Good Food Access Fund. State legislators are providing $250,000 in one-time funding towards the Good Food Access Fund. This was included in the Final Supplemental Budget signed by Gov. Mark Dayton. Originally, $10 million in recurring, annual funding had been requested. Shanasha Whitson is an urban gardener and food justice activist in North Minneapolis. Whitson’s vision for the Northside food system and food-based economy is one that pairs food and economic justice to reach social justice. She has lived in North Minneapolis “forever,” she says. Her vision for the future of the gardens is one that transforms her community. “The fruits of our labor would produce jobs. Those jobs would produce economic stability in the community and that economic stability would transform the crime in the neighborhood and transform the ways that neighbors interact with each other, the way that the entire community is viewed and interacts with the bigger systems. Kids wouldn’t have to sell drugs, they could sell tomatoes. Parents could be proud of their kids and kids could be proud of their neighborhoods and the neighborhoods would be models for cities,” said Whitson. Like Tietjen, Whitson sees the garden as a space for healing. Chaney echoes Whitson’s sentiments. He sees the gardens as a space for growing all sorts of things: opportunity, equity, collaboration, infrastructure, jobs, health and peace for starters. According to Chaney, Project Sweetie Pie is preparing to launch the Blackstar Line Fruit & Vegetable Emporium, as part of its “Pie-Squared, Green to the Second Power” initiative, the infrastructure development stage of the organization. “People think we’re growing food, growing a food system. But what we are really doing is far more profound, far more perpetual, and that is we’re really growing a green economy, youth enterprise, and food is just one avenue in which we can travel, because that is our common denominator as human beings. If we grow the food, we know the food, and then we can come to know each other,” said Chaney. On Aug. 27, from noon to 4 p.m., Project Sweetie Pie will be hosting the Irving Avenue Garden Folly, an old-school street carnival that will be taking place on 35th Avenue around the Story Garden. Proceeds will support Project Sweetie Pie’s efforts and the Story Garden. Beautiful story! Growing and Knowing. “If we grow the food, we know the food” Being in relationship with food is like riding a bike. We will remember. Gratitude to all those working. Thank you Michael for being so steadfast in your work which share with us your passion to keep the gardens growing for our community. Below is my response to the above quote! It is about the food, as food is not a metaphor, food is a reality and pivotal element in human existence. Food is a crucial and central agent for controlling one’s way of life/destiny. Cultures and countries are often destabilized because they don’t grow enough of the foods their population requires to survive and thrive. Many countries import much of the food they consume and therefore are quite vulnerable to famine, transnational corporate fascism, capitalist greed seed control, imperialists/colonists blockades, modern colonialism/imperialism and imperialists/colonists blockades. Growing food is a way of life, a discipline, the medicine for great mental, spiritual, physical and psychological health. Growing food is beyond any sort of economic system. It is about the food, as water, food and shelter are the essential ingredient for human survival. The other aspects are concomitant to food. All due respect for the vital work that is being done by Project Sweetie Pie and other organizations doing similar work!!! I will post this story on my Facebook page today. This is good. Basic goodness is happening here…thanks to all who participate! A food garden as foundation for larger transformation is supremely good. Our basic goodness is what we can always return to when we clean up our mess. We live and learn by making messes and cleaning them up, restoring our goodness. It’s always there just below the surface. I’m happy to know this is happening. Thank you! I have worked with Mr. Chaney on a couple of projects, donating labor and material, along with many others devoted to making peoples lives better. Michael makes things happen and gets things done through passion and persistence. Who’s rallying around you Mr. Hobbes, what have you done? All you have attempted here is to embarrass and slander others. If you have legitimate issues, there are avenues you can pursue, this is hardly the forum to seek re-dress. So necessary! Awesome article and initiative! University of Minnesota names its first female president The Board of Regents voted to confirm Joan Gabel with a five-year contract as the next president of the university. Gabel visited all five campuses during the interview process and answered questions about her vision of higher education.